Please note that this post is sponsored by Kitchen PLAY on behalf of Frigidaire and Lowe’s. Even though I was compensated the opinions expressed (and the yummy recipe) are all mine. Our a/c is on the fritz again and we’re counting the hours until our repair man can get here. I usually love having all the windows upstairs, but right now it’s rough. I’m keeping my cool with this vegan strawberry shake. 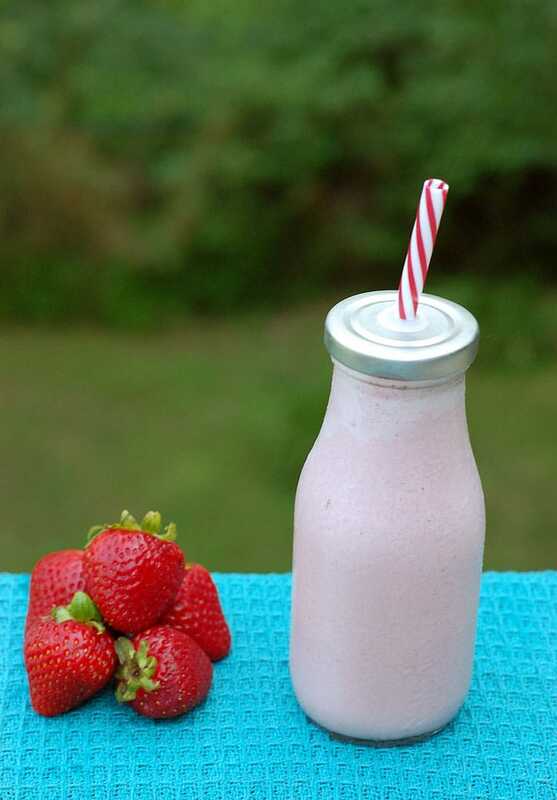 My Homemade Strawberry Shake Recipe doesn’t call for pre-made ice cream, so you can make it without running to the store. I don’t hate my kitchen. In fact, I have a very large kitchen with lots of cabinets, counter space and amazing natural light. But with all the new technology there’s always room for improvement. My stove is electric, even though there’s gas in the house, and the fridge is counter-depth. That means there’s just not enough space to store the CSA, veggies from the market and homemade nut milks. It’s always a disaster in there! With the new Frigidaire Professional Collection, it’s easy to achieve my dream professional-grade kitchen without the need for a full remodel since they were designed to fit in standard-size home kitchen spaces. The first thing I’d add in is the Frigidaire Professional 27.7-cu ft. French Door Refrigerator with the Dual Ice Maker (of course). The second reason I’m drooling over the fridge is that it’s a regular depth, so I would have room to bring home extra ingredients when inspiration hits.. There are also flip up shelves so there’s more space for full-sized pitchers of tea. I’d complete the redo with a Frigidaire Professional 5-Burner Freestanding Self-Cleaning Convection Gas Range and I just happen to already have the Frigidaire Professional Built-In Dishwasher with Bottle Wash Feature. All of the items within my dream kitchen board can be found at Lowe’s. One of the reasons I love making shakes without ice cream is that you always have the ingredients you need on hand. Better yet, you get to use your favorite nondairy milk and sweetener! 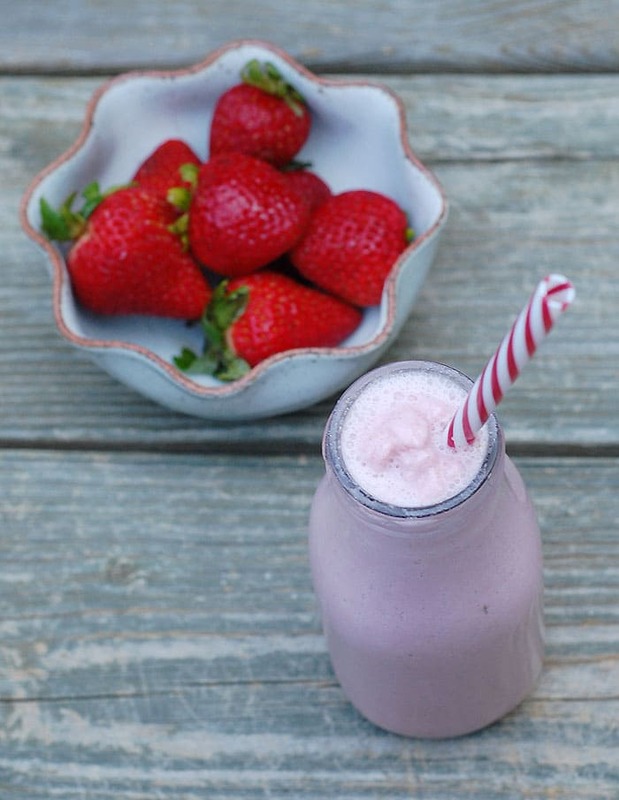 Last time I showed you how to make a Vegan Coconut Pecan Shake and this time I’m using my imaginary strawberries from my dream fridge to make a fruity shake! 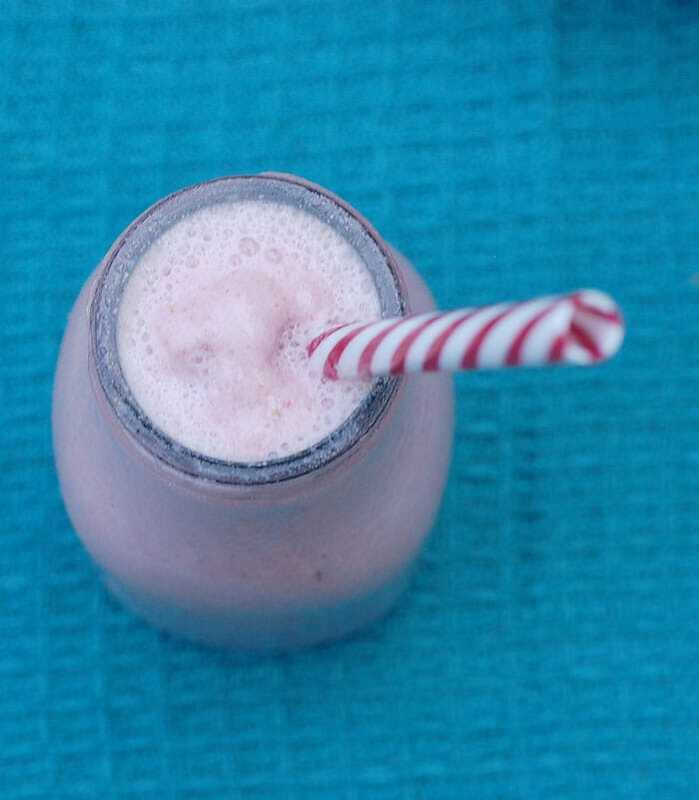 Make a shake whenever you want - even if you don’t have any vegan ice cream or nondairy milk on hand! If you want you can leave out the cashews and use nondairy milk in place of the water for an even quicker shake! Combine the water, cashews and ground chia seeds in your blender and soak at least 30 minutes. You can soak all day or overnight in the fridge. Blend until smooth and creamy. Then add the strawberries, vanilla and sweetener and blend until incorporated and smooth. Add ice and blend until it looks like a milkshake. 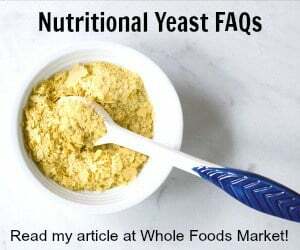 Please note: if you do not have a powerful blender you may need to add the first 1/2 cup of ice and blend, then add more in 1/4 cup increments until it's as thick as your blender will allow. Be sure to visit and follow Frigidaire @Frigidaire on Pinterest, Facebook, Twitter and Lowe’s @Lowes on Pinterest, Facebook, Twitter to get all kinds of ideas for your kitchen. Finally a recipe without banana in it! This is awesome, can’t wait to try it. 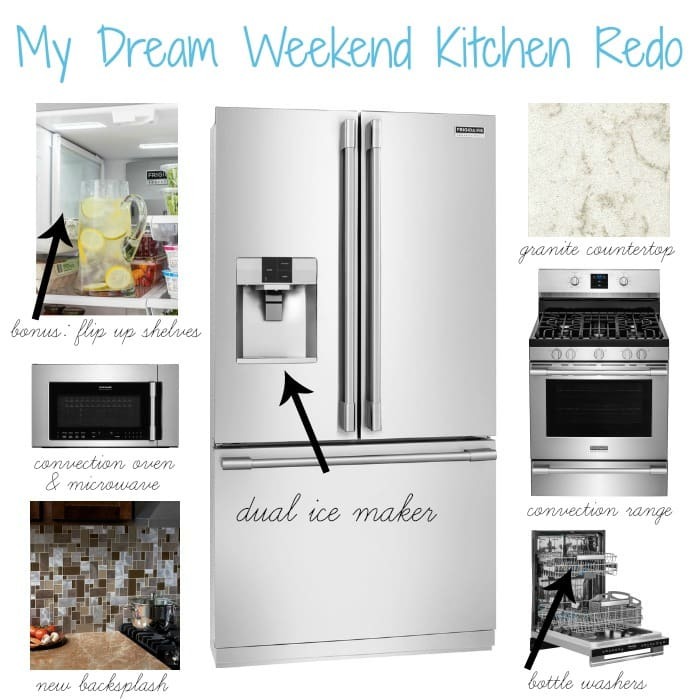 I love your dream kitchen redo inspiration board, especially the fridge! And I’m dairy-free so I will definitely have to try this vegan shake. I also can’t have bananas, so like Lynn who commented above, I am so grateful to see a strawberry shake recipe without bananas! Thanks! I have some other shakes and smoothies that don’t use bananas so you might like those too! I haven’t yet tried chia seeds but I’m getting a lot of “kid pressure” to get on the chia bandwagon. And this might just be the way to do and still enjoy myself. I’m not going to clean my kitchen or worry about what’s in the fridge, I’ll just go out on the deck and sip one of these! I love chia seeds and when they are ground you don’t even notice them. Cheryl has texture issues too but she does fine with this shake. You can’t even tell they are there once you grind them. What a totally dreamy looking shake! I love that it’s vegan friendly and perfect for summer! When The Beloved and I went window shopping for refrigerators a few months ago, we were all drooly over the flip-up shelf feature. Very cool and useful! This shake sounds great, and I’m sure I could deal with ground chia since like Kimberly Ann said, I have some texture issues too. Not sure I’d want to eat the nubby little guys whole. I will make you one and you can try it. I don’t think you will notice them at all. I love your smoothie with the addition of chia seeds. Looks real creamy and delicious! Great idea, I’ve never tried a milkshake using chia seeds! It works to make homemade Frappuccinos too. I can’t get over the idea of that flip up shelf! Now I want THAT! I don’t know which I want more – the shake or that fabulous backsplash?! A kitchen re-do is next on our new condo reno list. Thanks for inspiring me with lots of ideas! oh trust me, I struggled with my cooking schedule during last year’s kitchen reno! I was able to run up the hill and use my dad’s kitchen, and I actually was able to make quite a bit here without the oven (I had an impromptu kitchen set up in the dining room, with my slow cooker and toaster oven! so fun to see all the things on kitchen wish lists! and this shake. I want right now! Wow – you are my new hero!! My kitchen is in desperate need of a make-over, and your dream kitchen looks… well… dreamy! I really want a nice big fridge, a stove that’s from this century (mine is from the 1950s), and lots of cabinets. I’ll keep my fingers crossed for both of us to get a Frigidaire Professional 5-Burner Freestanding Self-Cleaning Convection Gas Range! I can taste the freshness of this strawberry smoothie! It looks so refreshing. I love your dream kitchen! I wish I could redo my kitchen and pick everything out, especially some new, stainless steel appliances!! We just moved and got a lot of the kitchen stuff we wanted, it is SO exciting! I want to try this recipe! It looks very good and since I am lactose intolerant this would work well for me! That dream kitchen looks DREAMY!! As does the strawberry shake. I love the gorgeous color and I bet it tastes heavenly! And you can use stevia! I really want to give this recipe a try, but I’m wondering if I used almond or coconut milk would that just replace the water and the cashews? Hoe much milk would I need to use? I know you mentioned using a non diary milk, but I just wasn’t sure how to substitute it. Thanks! I would use about 1 1/2 cups nondairy milk. I moved recently and I looked for a house with a big kitchen and that’s what I got. It is big enough for my small freezer and, since there were no appliances, I bought a fridge with no freezer space. That means the entire fridge is available for cold stuff. There is one extra tall shelf, which can be located anywhere. There are shelves the full length of the door, as well, also with one tall shelf. The door shelves are not adjustable. Many people are not aware that such fridges are available. My siblings all got stars in their eyes when they opened the door! Oh yes, great recipe. I don’t usually have cashews on hand so I might try this with coconut milk to replace the cashews and some of the water. I have the ingredients to make it today but the weather is too cold here in southern Canada.